Is St. Patrick's Day really right around the corner? I just can not believe it! 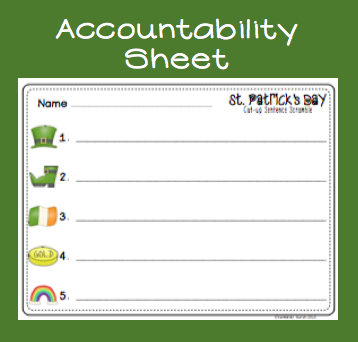 This packet also includes an accountability sheet for literacy station work. This would be great to use for the 5 days leading up to St. Patrick's Day. I have also included 3 sentences with periods, 1 using a question mark, and 1 using an exclamation mark. Here is a preview of what is included in the packet. If you leave a blog post comment, I will choose two random winners to win this packet. I will post the winners Tuesday. Here is a little freebie from Stephany's Jelly Bean Math Stations. Click on the picture below to go check it out. So cute! 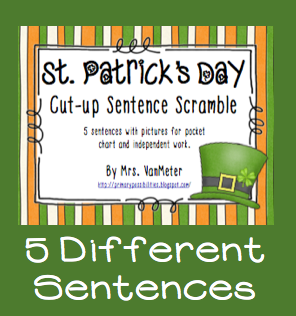 Sentence work is so important. Love the sentence scrambler. I think my kiddos would love it. 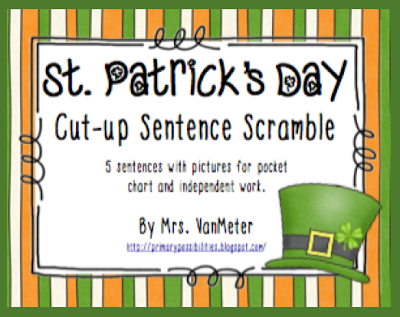 Love the St. Patrick's Sentence Scramblers! My students would love it! Thanks for the chance to win one. Hi! I love your jellybean measuring activity, it is so cute! I'm your newest follower!